Like a Swiss Army Knife, Mooseheart’s boys basketball team seems to have myriad objects to handle different situations, and so far in the Class 1A tournament, they have found the right device for every situation. Friday, the team needed stifling defense to defeat the hosts to claim the Serena Regional title. This portion of the Ramblers’ arsenal has been on display previously and keyed Mooseheart to previous wins over Hinckley-Big Rock and Westminster Christian. But what was different in Friday’s 63-49 victory over the Huskers was Michael Lowe’s offense. The junior was especially hot in the first half, scoring 22 points. He finished with a game-high 30 points and did not play the final minutes as both teams emptied their benches. 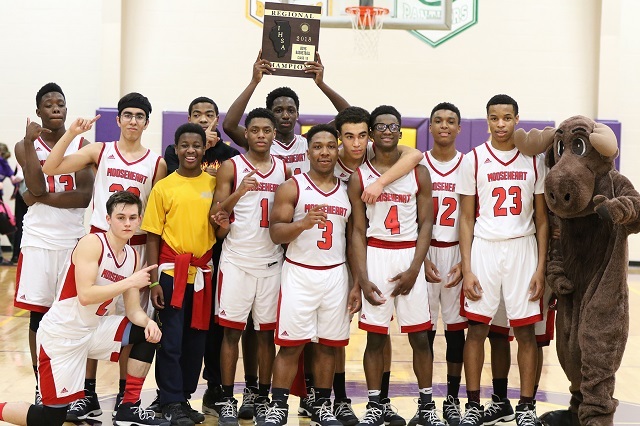 The regional title is Mooseheart’s third this decade, but its first since the Ramblers won the Class 1A title in 2013-14. Friday’s victory advances Mooseheart (16-6) to Tuesday’s Ottawa Marquette Sectional and a semifinal matchup with top-ranked Annawan, victors of the Galva Regional and owners of a 27-3 record. “We’re ready for anything. We’re going to come out and compete,” Lowe said. Daneels said he hadn’t put much thought into sectional opponents until after Friday’s game ended. Mooseheart got out to a hot start against Serena, jumping to an 13-2 lead. The margin remained 11 points – 19-8 at the quarter’s end and Mooseheart kept the lead in double-digits most of the rest of the contest. The Ramblers suffered a hiccup one minute into the second quarter when Wendell Lanphear was whistled for his third foul. Serena (15-15) rallied briefly, the Ramblers regained control, hit more outside shots and took a comfortable 38-14 halftime lead. While Lowe was dominating offensively, Na’Shawn Howze had a strong defensive game and added 14 points. Edgar Yusuf added 8 points for the Ramblers. While Serena attempted to come back numerous times in the second half, Mooseheart’s lead stayed above 15 most of the half and both teams gave bench players a chance to play late in the contest. Jakob Setchell scored 23 points for Serena but the Huskers struggled otherwise offensively. Branden Franzen and Jacob McVey added 8 points apiece in their final game of the season.